Scoop up some fun! These 2-Ounce Aluminum Kitchen Scoops are just the right size to dispense small candies and toppings for candy and yogurt shops. With clean scoops set near bulk candy bins, customers can easily help themselves without any concern about sanitation issues. Label buckets "clean" and "dirty" so customers can choose a scoop from the clean bucket and place back into the dirty one. Then once the dirty bucket is full you can clean it and place them back out. It's a super easy way to keep all your merchandise clean. Grocery and health food stores offer sections of bulk rice, flours, sugars, dried fruits, nuts, coffee and more. 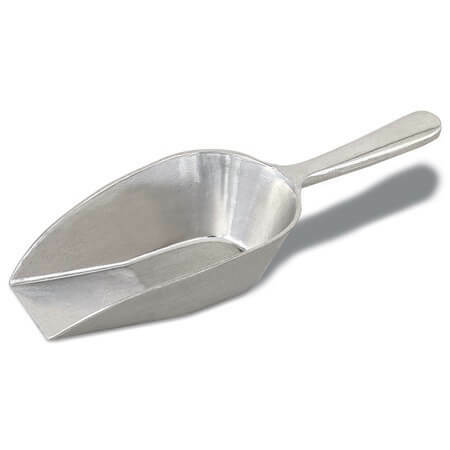 This small scoop is the perfect addition to your location for each and every bulk product you offer. These aluminum scoops can also be useful in your home kitchen as well as in your professional bakery where you can dish up all those dry ingredients for all your baking needs. Catering companies, restaurants, delis, cafeterias and so much more will make use of this kitchen scoop to ladle up ice for beverages behind the scenes. Go ahead and sprinkle on the fun with these small scoops. Place your order today.